A number of Baptist newspapers existed during the Civil War era, both North and South. Few were in business for the duration of the war, however. Among Baptists, denominational-specific newspapers in the South were seemingly somewhat more common than in the North by the time of the war. 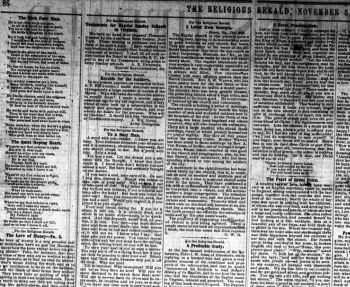 Some earlier Northern Baptist newspapers, by the war years, had either been discontinued, relocated to the South (the Washington, D.C.-based Columbian Star, for example, became the Georgia Baptist Christian Index) or morphed into topically-related periodicals, with a number of papers focusing on missions and/or abolitionism. In short, by the war era Baptist newspapers of the South tended to be denominational-centric, broadly news-focused publications and, during the war, seemingly more likely to focus on war-related news and commentary than their northern counterparts. In addition, by the Civil War, momentum in terms of Baptist growth in America had moved from the North to the South, contributing to the abundance of Baptist newspapers in the region. Copies of many of the above periodicals are available at the Southern Baptist Historical Library and Archives in Nashville, Tennessee. Copies of some Northern Baptist newspapers are available at the American Baptist Historical Society in Atlanta, Georgia.